These are some of the different ways you could describe the Mons Memorial Museum. Above all, it’s a venue where people from all generations are able to come and meet and interact right in the heart of a Memorial Region marked by the two world wars that turned the 20th century upside down. The Mons Memorial Museum invites visitors of all ages to question the multiple, complex realities of the phenomena of war. Through the fates of the men and women who witnessed events, visitors are immersed in the day-to-day lives of soldiers and civilians in times of peace, of war and of occupation. The exhibits on display, selected from the 5,000 included in the military history collections belonging to the City of Mons, ask some fundamental questions about the relationship between the civilian and military population. These questions come to life in an experience that will guide visitors from the middle Ages, through the “Ancien Régime”, right up to the two World Wars. An authentic "land" of memory The new museum space needed to continue the work of the former museum by bringing its collections to life again, but above all needed to mark a moment of change, by creating a radically different form of presentation which would fulfil contemporary expectations. The history museum has therefore been transformed into a place where questions are asked and where new technologies (e.g. 3D projectors, "serious games", interactive tables) are utilised to give form and depth to the historical content. The use of testimonies such as interviews and letters is also at the heart of the concept, which emphasises the notion of passing on the baton, of conveying history. From 13 June to 27 September 2015, Mons Memorial Museum hosts its first temporary exhibition, One number, one destiny. Serving Napoleon. In a unique visitor experience, the exhibition offers a chance to relive the practice of conscription as used during the period of French rule from the Battle of Jemappes (1792) to the Battle of Waterloo (1815). This first temporary exhibition expresses the desire of the new military history museum of the City of Mons to focus on the visitor experience. The conventional setting of the chronological historical exhibition has been abandoned in favour of a far more personal immersion. The basic idea is to give visitors a sense of the huge impact of conscription on the lives of people at the time. With this in mind, each visitor will draw a number by lot to decide whether or not he or she has been ‘conscripted’, and so determine the route taken through the exhibition – either the section presenting the daily existence of conscripts recruited to serve under the French flag, or that focusing on life for the civilians who stayed at home. Visitors designated as conscripts will find out, through poignant letters, objects and other exhibits, about the lives of the soldiers – many of them ill-fated – as they made their way right across Europe in the fight against France’s enemies. Meanwhile, visitors in the other group will learn how those who stayed behind in Mons saw their daily lives turned upside-down by the numerous reforms introduced under the French, including the adoption of a new calendar, the eradication of references to religion, the acquisition of the right to vote, access to a new economic market and exposure to new cultural influences. However the initial lot falls, each visitor will have the chance to explore the other section of the exhibition in order to gain an understanding of all facets of life at the time. 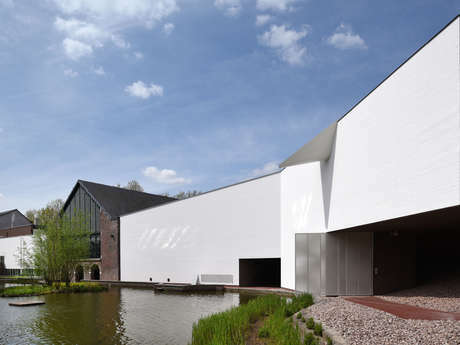 At Mons Memorial Museum, there is 1200 m² of space devoted to the permanent exhibition. By examining the objects on display and being exposed to the witness accounts, which constitute the real underlying theme of the visit, visitors can discover the military history of the City of Mons from the Ancien Régime to the Second World War. This history is presented and explained in the light of international events that explain the context. At the centre of an area heavy with memory, Mons Memorial Museum invites the public, at the end of their visit, to go on a journey through this area which has so many historical traces and memories. The period from the Middle Ages to the First World War makes up about a fifth of the space of the permanent exhibition. Owing to its strategic position, Mons has witnessed a great many conflicts throughout its history. Fortified since the 12th century, its history is interspersed with battles, sieges, great fires and periods of rebuilding. Occupied by external forces on numerous occasions, the town has also been home, in peace time, to a number of garrisons, positioned alongside residential areas. This necessary closeness between soldiers and citizens structured society in Mons in the shadow of the city walls. The independence achieved by the Kingdom of Belgium in 1830 marked the start of a long period of peace characterised by industrial progress, from which Mons and its surrounding region benefited considerably. The evolution of the city walls up until their final destruction in 1871, the battles, sieges, successive occupations, revolutions and the establishment of the Garde Civique (Civic Guard) are all subjects dealt with in this space. A large part of the permanent exhibition is dedicated to the First World War: almost half of the museum is devoted to it. During the years of the conflict, Mons found itself in an unusual position, swinging from battleground to occupied area. After being the theatre for the first clash between the British and German armies at the battle of 23 August 1914, Mons was later the place where the Allied armies came to a halt on 11 November 1918 in the wake of their victorious offensive. Before regaining their freedom, the people of Mons endured a period of occupation that lasted four years. All kinds of restrictions, endless checks and regular humiliation were part of daily life for all civilians, who, for the most part, endeavoured to keep living as normally as possible. The experience of the soldiers stationed in damp and muddy trenches on the Western Front is brought to life in detail. Their relationships with family members left behind, their reactions to new types of weapons, and their difficulties in looking death in the face are some of the subjects spoken about in soldiers' war diaries and in the letters they sent home to loved ones. These previously unseen witness accounts constitute the underlying theme of the visit, giving the historical events a sensitive, emotional aspect. The First World War engendered a cycle of violence that culminated in the Second World War. Like the 1914-18 war, this conflict makes up a large part of the permanent exhibition of Mons Memorial Museum. Mons was again invaded by an armed force and again experienced the torment of occupation. As before, civilians found themselves at the heart of the conflict, sometimes as part of the resistance movement, and often as victims of humiliation, deportation or even mass extermination. The liberation of Mons in September 1944 by American troops marked the start of a period of regained freedom and rebuilding, but also of socio-economic difficulties. Here, too, witness accounts by survivors of the era will give visitors a more personal view on the events that took place during these years. The new museum space is located in the site of the old “Machine à eau”. This remarkable building is of great historical importance to the City of Mons for its impact on civil life, architecture and urban development. Restored in the early 1990s, the listed building has been preserved and made even more magnificent as part of an ambitious architectural complex. Two contemporary extensions, one on each side of the historical building, subsume it to create a structure capable of living up to its new purpose. The architects Pierre Hebbelinck and Pierre de Wit and their team sought to respond to two important urban elements. The first is based on observations of the evolution of the City of Mons, which is at a major turning point in its development. In the 19th century, the city walls were demolished to make way for civic buildings (railway station, hospital, prison, schools, the Water Machine, etc.). This historical building witnessed a revolution in the behaviour of a society in flux. This period turned out to be a transitional one between the two major themes of Mons Memorial Museum. A period of defence and internalisation leading to a period of openness and progress, which would be more conducive to aggression than ever. This notion of transition convinced the architects of the importance of using the historical building as a means of expressing the project. The Water Machine will therefore become the meeting point, the reception area and the starting point for visits. It will be the central meeting place in a complex extending over more than 3000 m². The second urban element considered is the disintegration of the building's immediate environment, which is made up of a set of undefined spaces that undermine the Water Machine's position as part of the urban fabric. The position adopted by the architects aims to resolve this decomposition by re-establishing a frontage adjacent to the corner of Boulevard Dolez. The dimensions of the new sections will be aligned with the style of the older buildings, enabling them to maintain their own identity. The expression of the extensions develops two essential criteria. The first is to make the most of the light, open aspect of the body of the existing building. A large part of the building is cantilevered, symbolising the effort and difficulty of maintaining the balance of peace. The opacity or at least the openings chosen for the annexes are decisive in creating contrast with the characteristics of the Water Machine and in reflecting the introspective nature of the exhibits displayed throughout the museum. The architecture fulfils the scenario sought by the scientific and museum teams. The museum's content follows the chronology of the unique history of Mons in respect of the coexistence of civil and military life. The natural light of the Water Machine reflects the periods of freedom. The route through the museum, where this light is measured out, and at times coloured, involves gentle sloping so that visitors stride physically through the periods of conflict. The subject matters that concern Mons Memorial Museum find their full meaning in this location. These subjects are light (which is very much emphasised in the Water Machine and also directed towards the exhibits along the route through the museum), memory (i.e. making the most of the listed building) and history. - Glass: present in the wide façades of iron-mullioned glazing, glass will be used to create the openings and spaces for looking through in the two side wings. These openings will not only bring in light but, being positioned at strategic points along the museum route, will direct visitors to look at particular points outside. Another important aspect of the project was the execution of adjustments to the immediate surroundings, designed to assist in the journey through the museum. The architects wanted to give people the option to take a stroll outside, to complement their visit through the interior. Visitors will be able to get to the edge of the pond from the building. A memorial space is positioned under the building's cantilever, for those who wish to spend some time in contemplation or reflection after their visit. There is also a garden, where purple beech trees will be planted along with a Canadian maple, and poppies will be sown, according to the custom in the United Kingdom. Discover life at the building site through photos taken by the architecture practice of Pierre Hebbelinck and Pierre de Wit. Between 1871 and 1961, the Water Machine fed the entire town of Mons, making this water distribution network one of the most important in Belgium. In 1861, a vast construction project began in Mons, changing the face of the town forever. For a few decades it was like a building site, the whole thing beginning with the destruction of the Dutch fortifications. Thus in 1865, wide roads began to appear, with the network of trunk roads and the town's boulevards. New routes, created as extensions of the main roads within the city walls, were built to link the centre of Mons to the new suburbs on the outskirts. New public buildings were built along the lengths of the boulevards: the public hospital, prison, railway station, teacher training college, etc. The destruction of the fortifications also gave the local authorities the opportunity to start work on a vast water distribution project. The poor hygiene conditions and pollution of the groundwater represented health risks for local residents of Mons. Memories of terrible cholera epidemics in the first half of the 19th century endured. In 1863, the town councillor and engineer Jules Drion proposed diverting the course of the River Trouille, which passed through the town. A long sewer would be built along the old route of the river and the town would be fed with water via a pumping station. The project was approved in 1865. Major works began in 1869: laying pipes, installing tanks, and building the dam and spillway. To accommodate the lifting equipment, a building was built in Boulevard Dolez, in 1870-1871. The designed by the Mons-based architect Joseph Hubert, consisted of a large hall which received light via its large glazed façades. Brick walls supported a steel frame forming a double-sloped roof. This central part was flanked by two wings made of stone and brick, built in the tradition of early 19th century utilitarian industrial architecture. The Water Machine began to supply drinking water in 1871. After almost a century of loyal service, in 1961 to be precise, the Water Machine was dismantled. The installation was closed for good in 1974. The only thing remaining is the main building, which was listed in 1977 and was restored by the neighbouring National Bank in the early 1990s. A small pool acts as a reminder of the swimming pool and watering hole which was formed thanks to the dam that had held back water from the River Trouille. The building was sold back to the City of Mons in 1996. The people of Mons still feel considerable attachment to this building, which has been part of their daily lives for 140 years. Although the place has lost its original purpose, it remains alive, hosting a variety of cultural events. Lots of local people can still remember coming to see the impressive machinery, its brass and steel components shining in the sunlight. Now though, it's a setting for various cultural events. It is currently being readied for its new life. From 2015, it will host the new interpretive centre of the military history of Mons, named the Mons Memorial Museum. More than a mere venue for exhibitions, this new museum space will invite visitors to reflect on the major conflicts of the 20th century, by learning about painful periods in the history of Mons. The objects on display will give much food for thought. On loan from some of Mons's rich collections, they will ensure the longevity of a culture and a memory maintained since the establishment of the Centenary Museum in 1930. Right from the start of the First World War, Mons found itself at the heart of the conflict. It was in this region that the first clashes took place between the German army and British soldiers, whose ranks included the man who became the first British casualty of the First World War, John Parr. During the Battle of Mons on 23 August 1914, a small army from across the English Channel confronted a German force that was twice its size. In the end, the British troops managed to pull out of this dire trap – perhaps by the grace of the Angels of Mons? From here, they retreated to France. Upon their arrival, they fought another bloody battle in Cateau in Cambrai. For the soldiers of the British Empire, Mons represented the start of a terrible four-year conflict – which also ended in Mons on 11 November 1918, the day the armistice was signed. On that same day, Private George Lawrence Price was killed by a German sniper in Ville-sur-Haine, very close to Mons. He was the last soldier of the British Empire to be killed during the Second World War. For the British army, Mons became a highly symbolic place: the First and the Last. Indeed, it is at St Symphorien Cemetery where the remains of John Parr, the first British soldier premier killed in the conflict, and of George Ellison, the last British soldier killed in the conflict, are buried, opposite one another. Due to its central position in the battle of 23 August 1914 and in the last clashes of the war on 11 November 1918, Mons is at the heart of an area heavy with memory. There are monuments, memorials and symbolic places all over the region. With the Parcours de mémoire, which will be ready from August 2014, we offer you a way to discover and rediscover places of battle, tragedy and contemplation. The result of an international partnership, the project to create the Parcours de mémoire is supported by various partners based in Mons (City of Mons, Tourist Office and Mundaneum) and in the region of Cambrai (Tourist Office, Community of villages of Caudrésis-Catésis and Community of the urban area of Cambrai), and is funded by the European Union. The overall aim of the project is to highlight the British retreat of 23-26 August 1914 by creating a route in memory of a task force that fought in Mons and withdrew to Cateau.